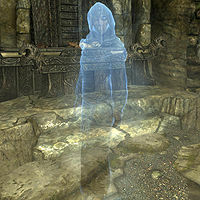 Atmah is the ghost of a Redguard sorceress who only exists during impressions of past conversations with the Arch-Mage during the quest The Staff of Magnus. Atmah was the Arch-Mage's favorite student during her time at the College of Winterhold. She led a group of mages, including Savos Aren, Hafnar Ice-Fist, Takes-In-Light, Elvali Veren and Girduin to an off-limits ruin called Labyrinthian. After encountering various monsters like a skeletal dragon and draugr, only Atmah, Hafnar, and Savos Aren were left alive. The trio then proceeded into the final chamber to confront Morokei, a dragon priest, where Savos magically enthralled Atmah and Hafnar to keep the dragon priest contained. Atmah and her dead companions' ghosts haunt Labyrinthian, forever re-enacting the scenes of their exploration for whomever follows in their footsteps. The apparition of Savos can be seen at the end of the dungeon, mourning for his lost friends and cursing himself for leaving Atmah and Hafnar behind. The Staff of Magnus: Retrieve the Staff of Magnus. This page was last modified on 26 February 2014, at 06:24.